A break from my holiday posts with some local content. We had Sunday brunch at Hangout Bar N Cafe in Como a few weekends back. Even though it was busy, we managed to snag a table pretty quick without a booking. The cafe was surprisingly cozy with a fireplace, unfortunately we were seated near the door which meant chilly blasts of wind when patrons came in and out the cafe. 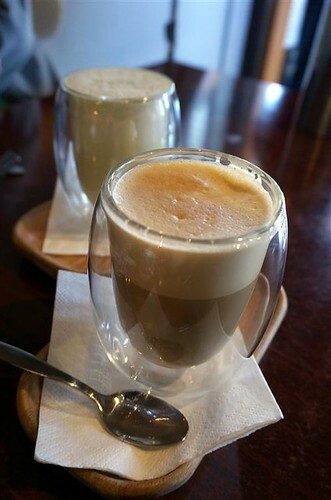 They have a wide range of coffees and flavoured hot chocolates ranging from tiramisu latte to green tea latte. I liked their fancy glasses. Their Big and Tall ($20) breakfast which comes with a glass of fruit juice. 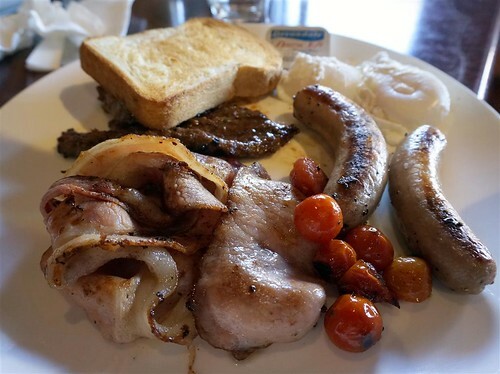 This is one for the hungry and was a pretty good all rounder big breakfast. 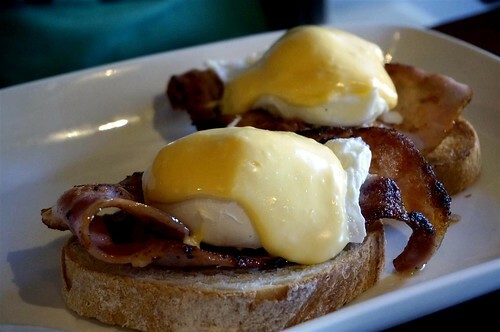 Eggs benedict ($17), HC said all was tasty. 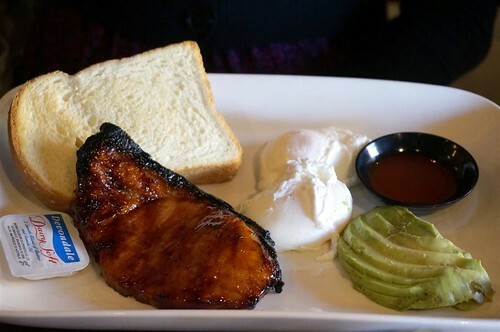 Jo’s honey glazed 1 inch bacon which came with poached eggs, avocado and habanero sauce ($17). The bacon was lovely but I’m not sure that the habanero sauce added to the dish. Overall we enjoyed our brunch and will definitely return some day. They take bookings so that’s convenient too. Jason is back in town! Only for a short three weeks 😦 but beggars can’t be choosers. We only have him for another week before he returns to London. So tonight we met up with him for dinner at Jun. 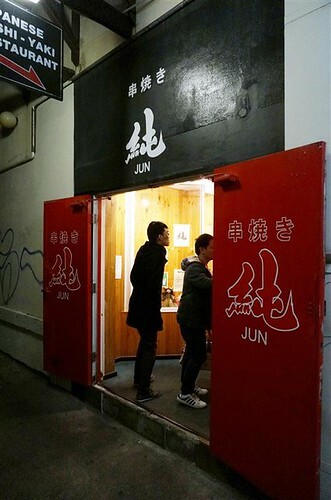 I’ve heard great things about Jun so was glad we finally got to go. The restaurant is hidden underground in a little alley, but word has gone out so it’s no longer a secret in the CBD and is always packed at lunch time. 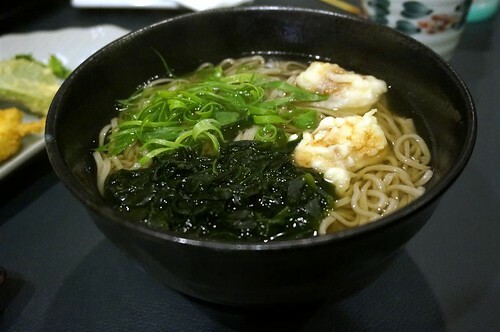 I can never resist ordering zaru soba ($10) even though it’s a bit mad to have cold soba on a winter night. 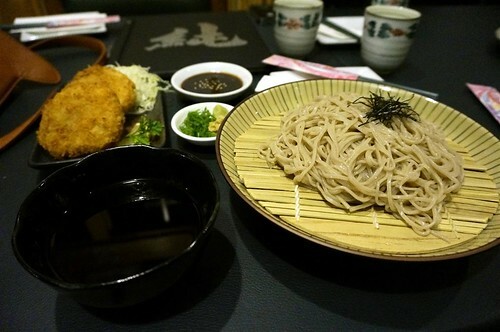 I had the yummy soba with a side of croquette ($8), very crunchy texture and I was suitably pleased with my choices. R’s soba in soup ($10) he immediately regretted his choice after trying my zaru soba. It tasted alright but the texture of soba was lost in the hot soup. The rest of the guys had set meals. 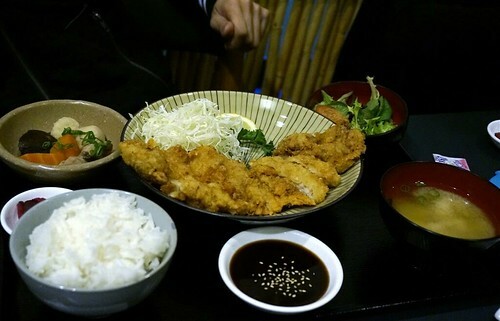 This was Jason’s katsu chicken meal ($28) which came with side dishes, salad, pickles and miso. He let me try some of this chicken with was very crunchy and well fried. Jo had the Jun yakitori set ($30). 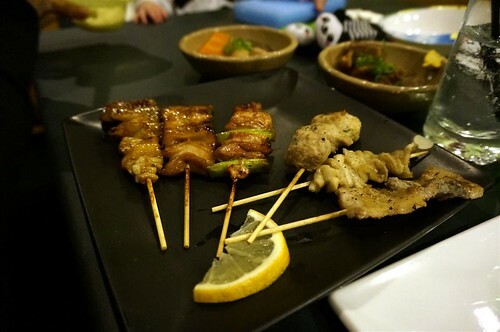 Jun is most well known for its yakitori and it was easy to see why because they were all very well done, grilled to perfection, moist and tasty. 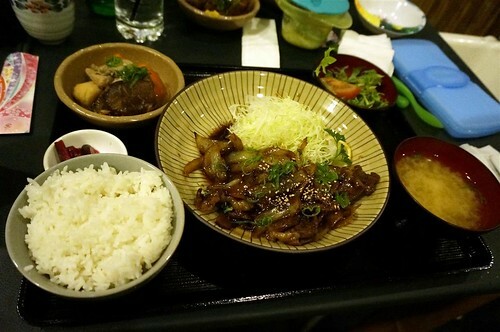 HC’s teriyaki beef set ($28), he is a huge teriyaki beef bowl fan and really liked the beef here. I liked their side dishes of simmered pork stew, just something different from the normal salad. 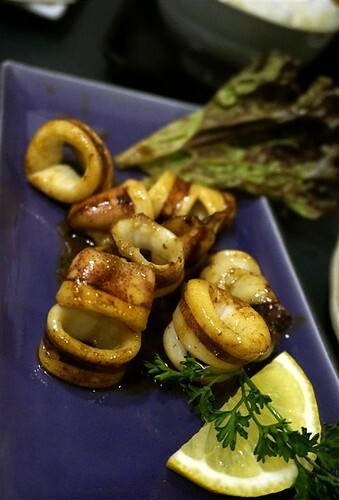 Side dish of baby squid in butter soy sauce ($8), R thought it was great with just the right texture and I liked their butter and soy sauce which had the right amount of sticky sweetness. While Jun’s prices are perhaps on the slightly higher end, I do admire their wide variety of authentic Japanese dishes on the menu, everything was faultless (except if perhaps the waitress was a bit more frequent with her green tea serving) and we had a fun winter night. 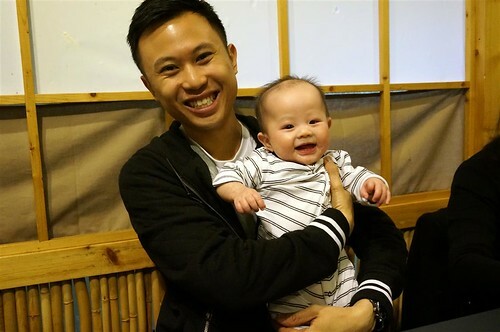 Baby Tristan really liked Jason and couldn’t stop smiling all night. Sigh, can’t blame the baby, I love being around Jason too. It always feels so comforting and familiar whenever Jaso is here and we always have such a nice time whether it’s squabbling with each other or having one of our D&Ms (an abbreviation taught by Jaso haha, it means deep and meaningful *face palm*). 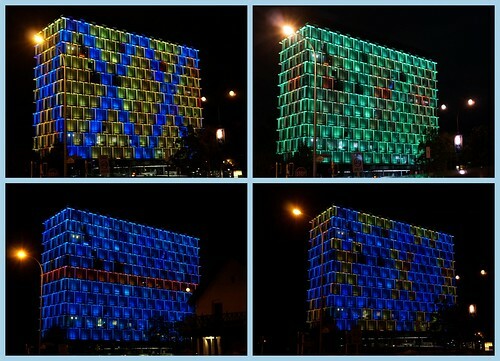 The different colours of the Perth Council House at night. I doubt Perth will ever become a cosmopolitan city like London, Paris or even Sydney and Melbourne, but the gradual growth of Perth suits the boring ol’ me and it’s becoming more and more like home especially with the arrival of Jan and family. Looking forward to the rest of 2013 and beyond. 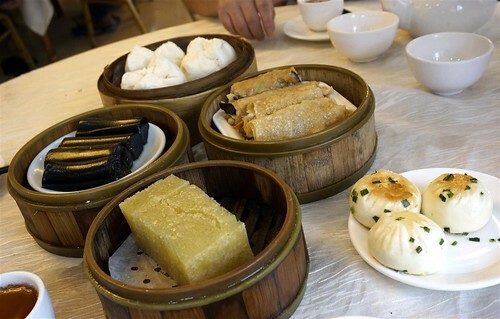 Wouldn’t be right to visit Guangzhou without dimsum for breakfast. We went to Gerry’s ‘local’ dimsum restaurant which was a convenient short walk away from his house. Their variety of dimsum was definitely more wide ranging that what we have in Perth. Gerry ordered this dish for us thinking that it was 沙 翁 Sa Yong, as in chinese sugar puffs which were a favourite dessert from my childhood. These light and airy sugar puffs are somewhere between light cream puffs and sugary doughnuts, I haven’t had many in my lifetime which is a sad regret. 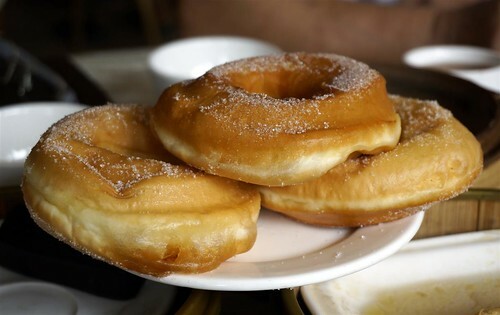 But when I ate these ‘sa yong’, I was deeply disappointed and didn’t quite know how to tell Gerry that they were different from the sa yongs of my childhood and more resembled heavy doughnuts. Then R had a bite and said ‘Donut leh‘. Hahaha. So they were actually doughnuts after all. I will always remember the good times that we had at Gerry’s hometown. I hope we return again some time soon. 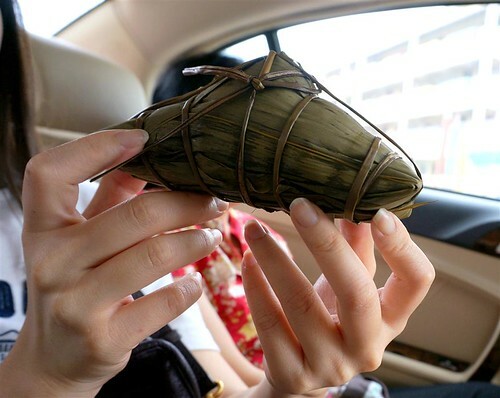 It was a few days to go before the Dumpling festival so Gerry’s mum gave us a bag of zhongzhi which lasted us for days. Before we headed back to Hongkong, Gerry’s family wanted to show us some of the tourist sights in the area. 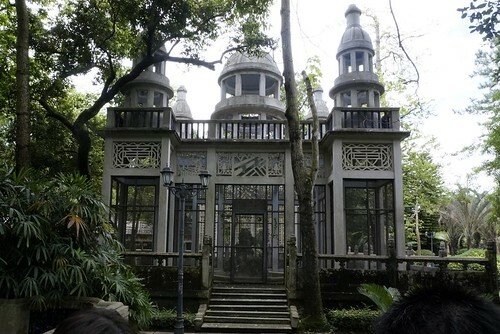 Perhaps the most famous of all the tourist attractions were the Diaolous 碉樓 located in Kaiping city. What is a Diaolou? 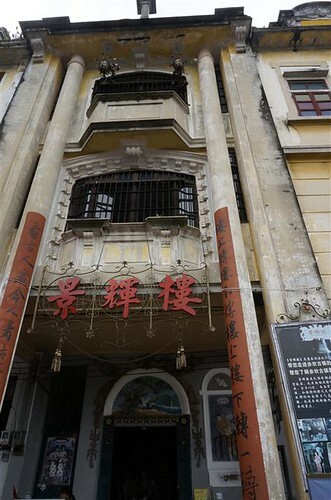 These multi-storeyed defensive village houses/towers were constructed in the Kaiping area from the early Qing Dynasty and were used as houses as well as defensive watchtowers for protection against bandits. Today, these Diaolous are listed as UNESCO world heritage sites. 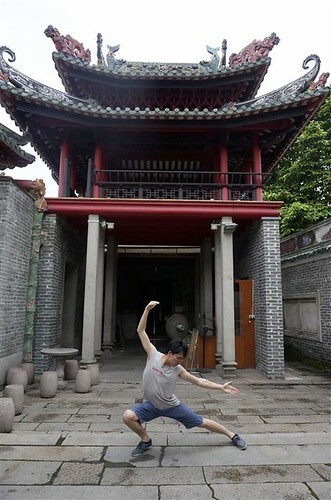 The architecture of the Diaolous are a mixture of Western and Chinese fusion. Gerry’s uncle explained that they were built by the wealthy families who returned from overseas (North America, South Asia etc.) and were influenced by the Western architectural styles. 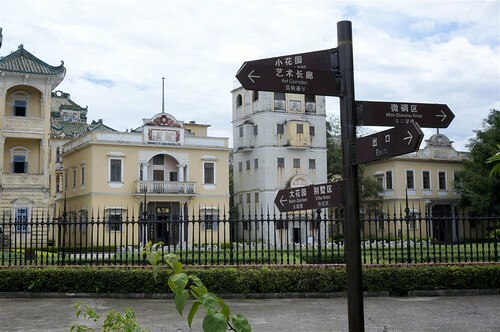 This reflects Jiangmen’s reputation as the first hometown of overseas Chinese. It was a miserable rainy day so we skipped most of the Diaolous and headed for one of the main Diaolou being Li Garden 立园. 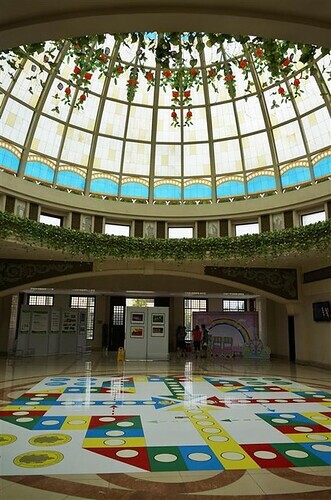 The main lobby before we enter the grounds. Anyone for a game of Aeroplane Chess? 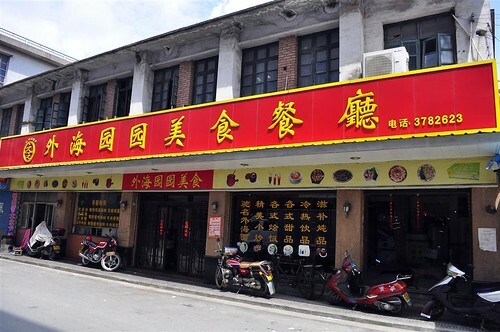 Li Garden was a built by an overseas Chinese American, Mr. Xie Wei Li ( made his money in the chinese herbal business in America). 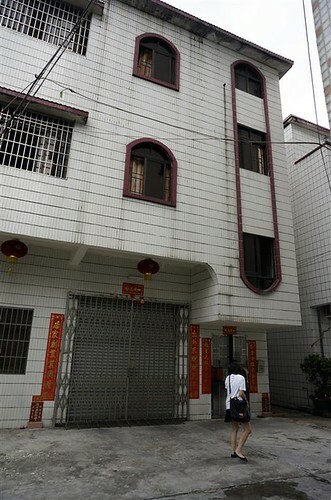 Mansions of the Li Garden estate. 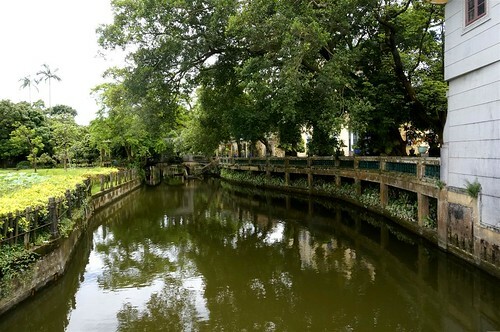 Man made waterways and gardens around the estate. For some reason part of Li Garden is being used as a photography set for wedding couples! R and I couldn’t resist taking photos at some of their ‘sets’. 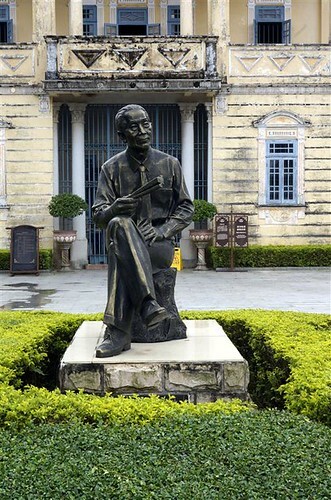 Despite living in America, Mr Li kept thinking of his home country and eventually returned to China spending 10 million yuan building the Li Garden estate, starting in 1926 and finishing in 1936. 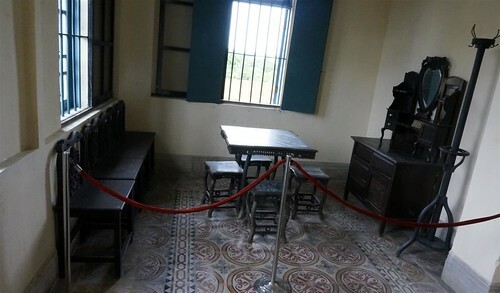 The furniture and furnishings in the Diaolous were a mixture of East and West. 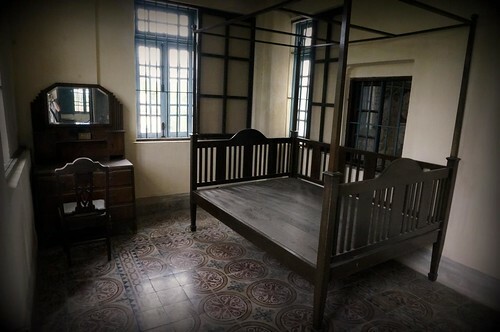 I found everything a bit scary, maybe it was the downcast skies and rainy weather that aided the gloomy feel of the dark rooms. 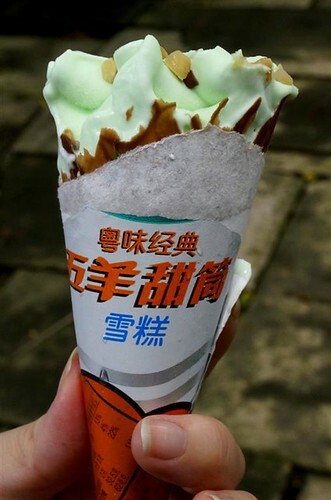 My favourite part of the Li Garden tour, eating local Wu Yang brand ice cream! This was honeydew flavour which was so refreshing, I loved their flavours including red bean, double skin milk and mango etc. I wish they sold Wu Yang here. Stopping by Chikan town in Kaiping which now feels like a dead town with all the youngsters having left the town for the city. 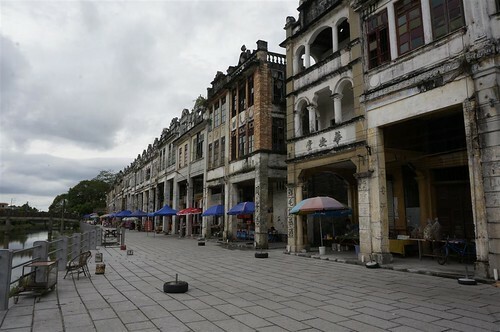 Still this town is well known for being the site where many movies and dramas are filmed. Movies that were shot here include Ip Man, Drunken Master II and Let Bullets Fly. 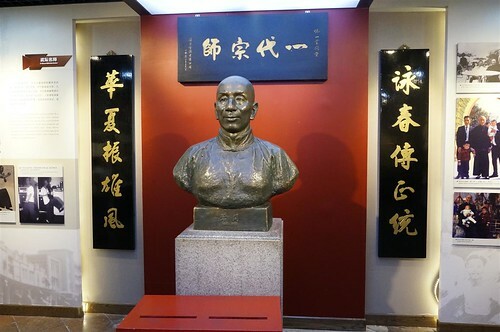 Even though our butts were getting sore from all the car travel, we couldn’t resist stopping by Foshan, the home of the great martial art master Huang Fei Hong. 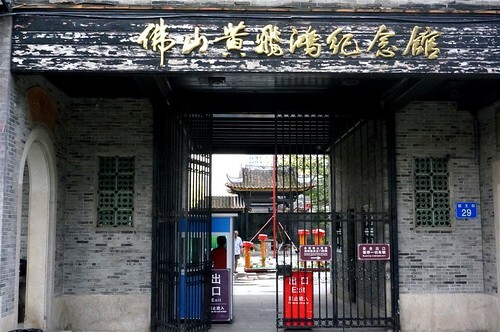 Our main point of destination was the Foshan 祖庙 (ancestral temple) which also housed the Yip Man and Huang Fei Hong memorial museums. Yip Man, also known as Bruce Lee’s shifu. Hehehehe. Martial arts geek. Enough said. Stopping for a snack, this was mang gong yuen, as in blind man’s dumplings. Not bad. My first time eating 蛋散 literally meaning egg shatters. 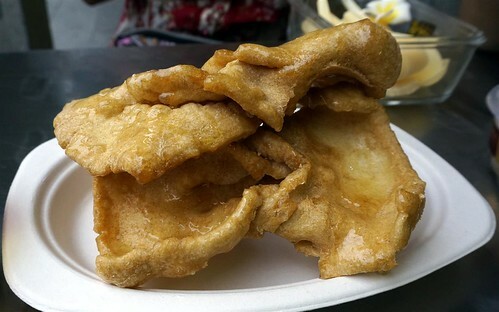 This dim sum is made from a dough of eggs, flour, sugar and lard and is twisted, deep fried then drizzled with malt syrup. Very crunchy and I can see why it’s a popular snack but it was a bit doughy and deep fried for me. 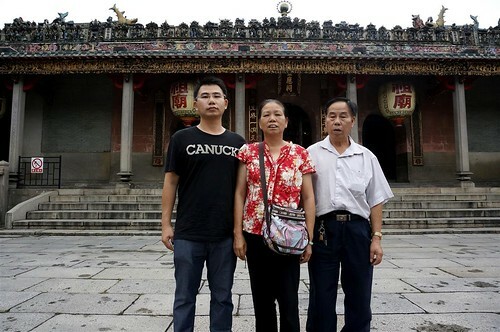 The best and most hospitable family in Jiangmen in front of ZuMiao. 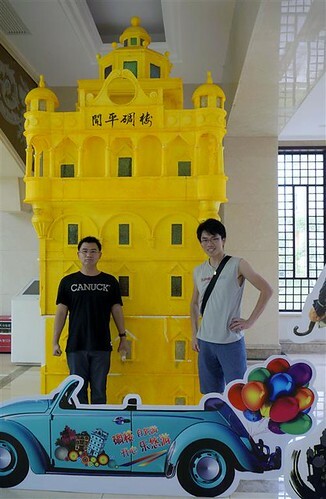 Thank you Gerry, 勤姐 and 强哥 for an extraordinary and most memorable trip in Jiangmen. We will be back. We woke up well rested from the exciting and food laden day before. 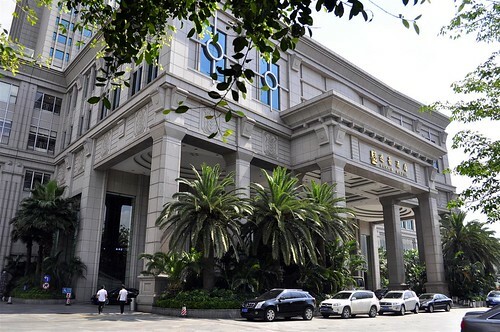 Gerry, being the perfect host, had put us up in yet another five star hotel in Jiangmen, 逸豪酒店 Yucca hotel, which was grand and comfortable. 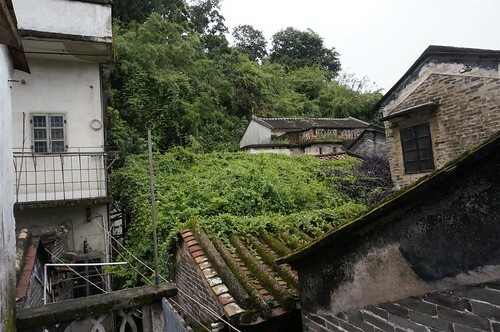 The view of Jiangmen from the hotel window. 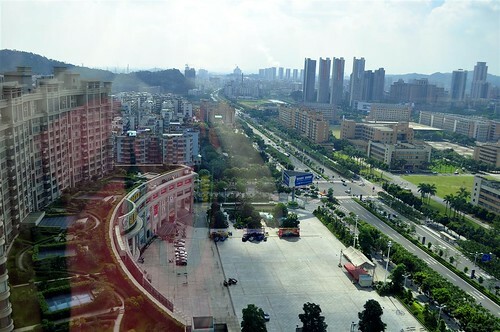 Geographically the city is located in south-central of Guangdong province, Zhongshan is in the east and Foshan in the north. 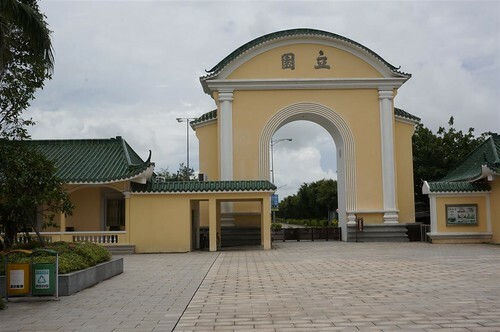 The homeland of 3.68 million overseas Chinese, Jiangmen also has a reputation as ‘the First Hometown of Overseas Chinese”. Knowing R’s love for noodles, our first stop for breakfast was this noodle restaurant. Our bowls of noodles, generous portions. 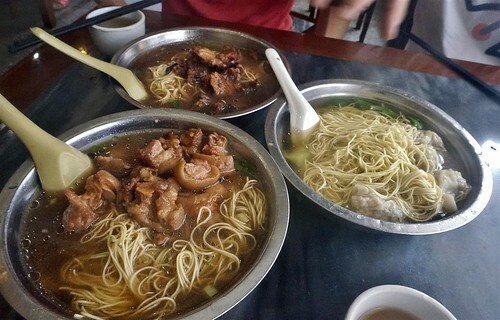 I had the beef brisket noodles, Gerry had wanton noodles and R had pork trotter noodles. All were yummy especially the springy egg noodles. In fact, knowing how much we liked the noodles, Gerry’s parents gifted us with two BOXES of Jiangmen’s dried egg noodles (=^ ^=). 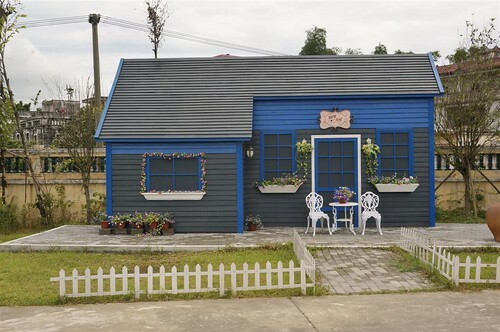 The exterior of Swallow brand Jiangmen Pai Fen factory. This is an inside joke. 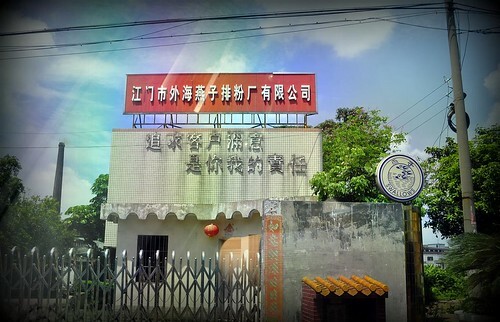 JiangMen Vermicelli is probably one of the more well known if not THE most well known brand of rice vermicelli and is sold everywhere in the world. Back in the old days we kept forgetting where Gerry’s hometown was even though he reminded us several times. In the end he said ‘you know 江門排粉? Well, that’s where I come from!’ Since then we joked for years that we would visit Jiangmen just to eat the vermicelli there. So Gerry brought us to the factory :). You would think after eating such a big bowl of noodles it would be some time before we had lunch. But no, Gerry’s uncle had it all planned out. 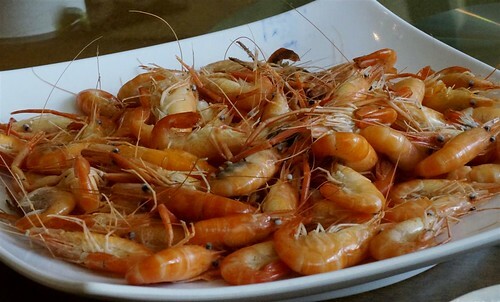 We were in for an eel feast, another specialty of Jiangmen, but first up were these little sweet prawns as appetisers. It was really nice of Gerry’s uncle to take time out from his busy workday to meet us for lunch. In 2010, Gerry’s good friend Hom visited Perth for a brief 3 days and we had a great time showing him around. Fast forward three years, Hom is now married with a little daughter and we were able to catch up over lunch :). 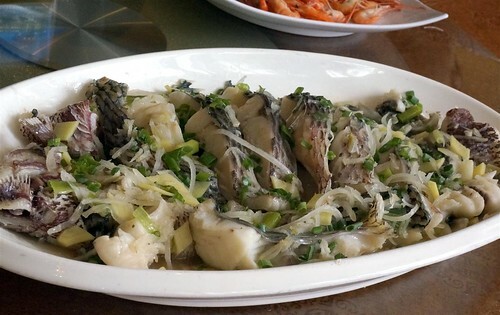 The star of meal the steamed eel dish. Afterwards, we also had fried rice with eel. Gerry’s mum loved this dish. 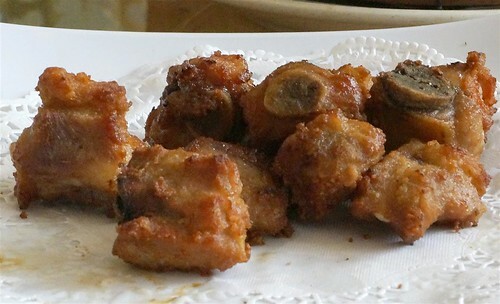 Jiangmen is also famous for it’s dried tangerine peel and these fried tangerine peel infused spareribs were wonderfully fragrant and tasty. 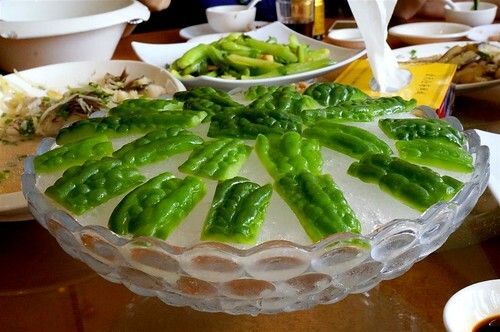 It was the season for bittergourd and we were told that the best way to eat them was bittergourd on ice! Dipped in a bit of soy and wasabi, the bittergourd slices were crunchy with only as slight hint of bitterness, really good and such a refreshing way to eat bittergourd. 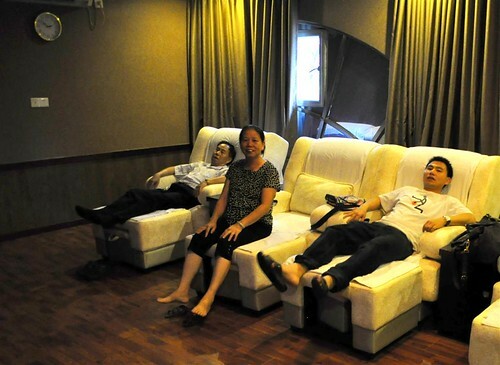 After lunch, Gerry’s uncle suggested that we go for a relaxing foot reflexology massage. Now these Chinese foot reflexology shops are very popular in Malaysia and have even been popping up all around Perth. 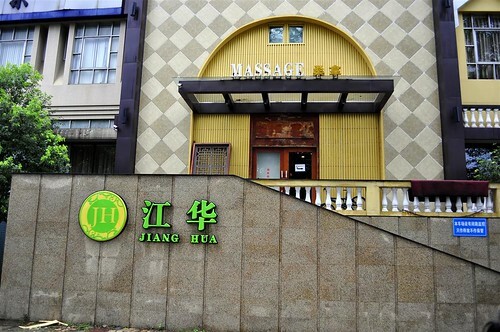 Funnily enough, I’d never been to one of these centers so why not try them in China? It was all very fun and hilarious because Gerry’s parents joined us! Gerry’s mum delighted the masseurs with her wisecracks and funny questions. More eating! We stopped by this traditional dessert shop for some chinese desserts. Couldn’t go past the Double Skin Milk and Black Sesame Paste again. 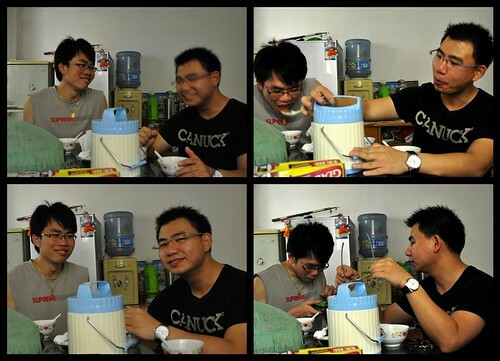 Taste wise, the double skin milk wasn’t as smooth or creamy as the one we had in Nanxin, but still, it was very good. 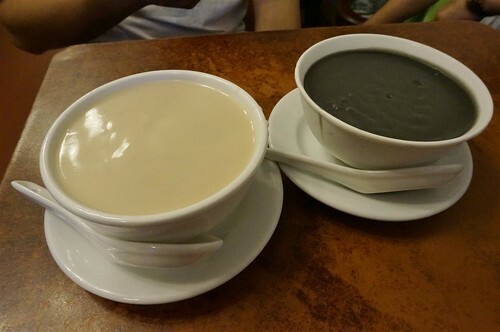 The Black Sesame Paste was very good and fragrant. 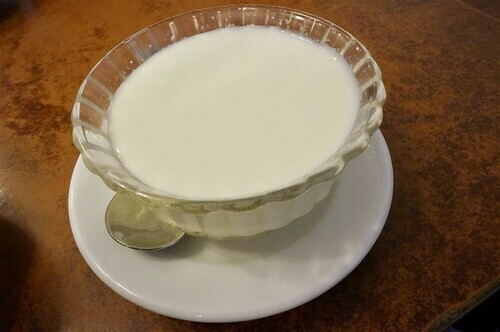 Gerry’s parents and I had the 姜撞奶 which literally means ‘ginger knock into milk’, ginger milk pudding. I love ginger and the notes of heat from the ginger with the smooth milk pudding was great and comforting. 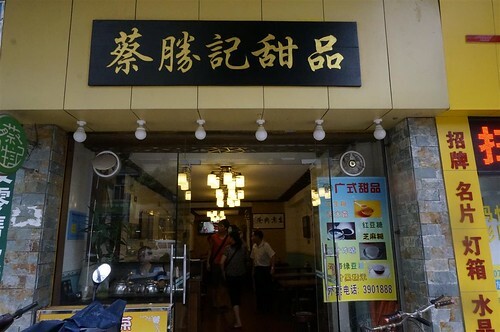 The best part about being in Jiangmen besides spending time with Gerry and his family was getting to visit the places that he grew up including his high school, his ‘local’ yumcha restaurant etc. 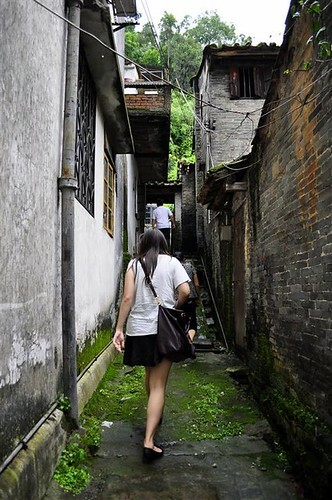 We also stopped by his very first home with its old stone steps and narrow alleyways. Gerry’s first home was an eye opener, tiny place opening up to a rooftop with this view. It was a sentimental and touching moment for us to listen to Gerry’s mum telling us about their early life, Gerry’s childhood and how she made her livelihood (and still does) fortune telling. In fact, she decided to read our palms impromptu and it was eerily accurate. We were supposed to head off to Macau that evening. 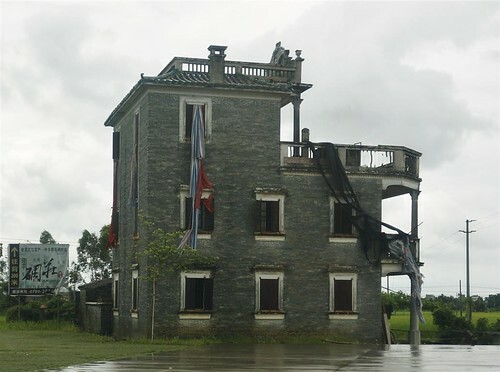 But one thing led to another, and we found ourselves opting to skip Macau and to stay another night in Jiangmen instead. Only this time, we would stay at Gerry’s house! 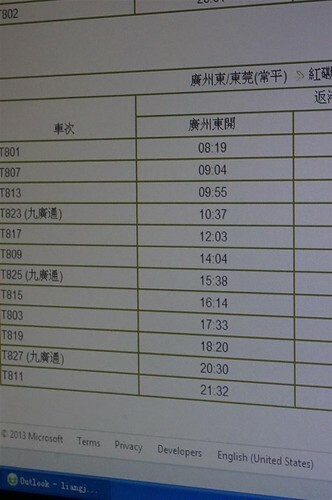 In the end we were researching the train times to return to HK from Guangzhou. I remember sitting in Gerry’s dining room, eating a feast including more roast goose and homemade waxed meats prepared by Gerry’s father. Praying to the gods at close to midnight, throwing rice and wine on Gerry’s porch. A midnight supper at an outdoor stall near Gerry’s home where we had fried mantou dipped in condensed milk (very yums) and fish porridge. Everything felt very surreal, magical and dreamlike. It was one of those nights that will be etched in my memory forever.